This review was written on May 2016, when Blood Pressure Protocol was hosted on the domain blood-pressure-correct.org. However, the scammer behind this program has moved it to another domain bpsecret.com. He also redesigned the website and removed one of the major incriminating evidence outing it as a scam. But as you must have noticed, Blood Pressure Protocol is STILL A SCAM and this review remains accurate. Read the review to find out the incriminating evidence the scammer removed, and yet another reason why you should NOT buy this program! 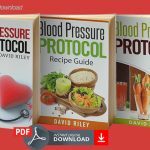 Blood Pressure Protocol by ‘David Riley’ and ‘Dr. Miles Channing’ is nothing but a too-good-to-be-true scam, and I’ve got the damning evidence to back it up. Please sit back and read this review to the end, as it will save you a lot of time, money and energy. 1. David Riley Does NOT Exist! 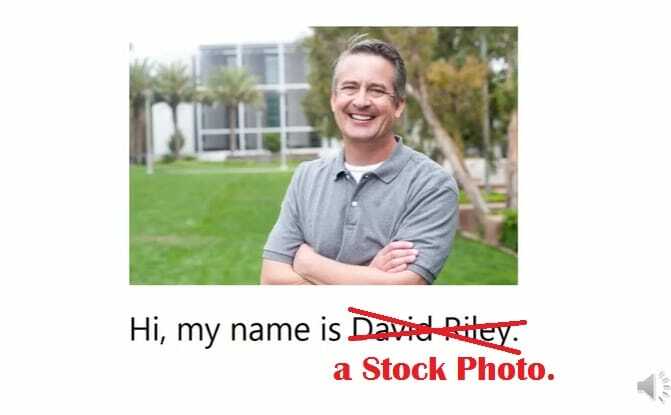 As is my custom, I tried to verify the identity of this David Riley but unfortunately, I discovered that he is just a stock photo anyone can buy from Dreamstime.com. How disappointing. For doubters, here is the link to the Dreamstime image. The people featured in stock photos are just models and for those that do not know, stock photos are used for illustrations and design. So the guy in the photo above is 100% NOT David Riley. He’s just a model who does not have the power to decide who uses his photos and how they can be used. Therefore anybody can use them for anything, as long as they pay the right amount of money for them. If you do a quick reverse image search using Google, you’ll quickly notice that this same photo has been used in many other unrelated websites with different names attached to it. This is just an extra info confirming that the ‘David Riley’ of Blood Pressure Protocol does not exist … which essentially means that we are dealing with a scam! Update 12.09.2017: The scammer behind this product has removed this photo from the website, and in its stead is now a middle-aged man calling himself ‘David Riley.’ Don’t pay attention to that man. 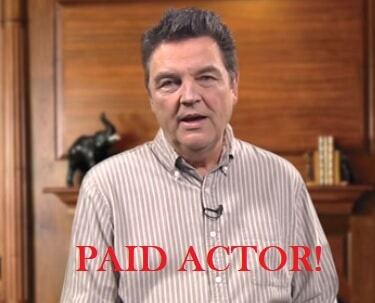 He’s NOT David Riley, he’s a paid actor! 2. Dr Miles Channing Does NOT Exist! Do a quick search online about this Channing, and you’ll see that there is no single information about him. He is not even mentioned in the INTERSALT study! 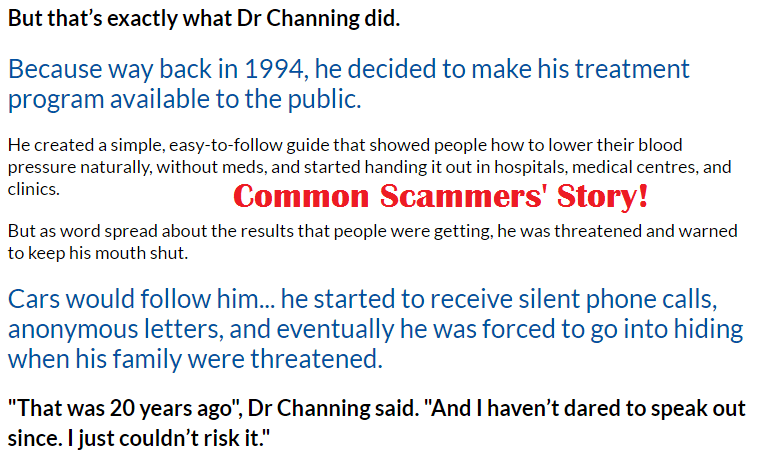 The scammer knows very well – in fact, he hinted in the video presentation – that Dr Channing is non-existent. That is why he is trying to sell you the story that Channing went underground when the notorious ‘Big Pharma’ marketing anti-hypertensive drugs warned him not to release the ‘all natural’ solution he found for hypertension to the public. As usual, the scammer went as far as alleging that Channing’s family was threatened. What you just read in the screenshot above is one of the classic stories often told by scammers with the aim of convincing you that their product is so good that pharmaceutical companies are afraid it would put them out of business. Even though it is true that some pharmaceutical companies can be dirty, they are strictly regulated by government health agencies so they cannot toy with people’s lives without paying dearly for it. Therefore don’t be afraid to patronize the ‘Big Pharma’. They both claim that the respective tribes do not have cases of the subject health condition. I know we’ve not seen the last of these similar websites. The scammer behind Blood Pressure Protocol was flat-out lying when he claimed that Dr Channing led the INTERSALT research in 1982, which was concluded in 1991. This is because, as I earlier stated, the first (and only) INTERSALT study was carried out from 1984 to 1997 … and it was led by Dr Jeremiah Stamler. Again, the scammer was not completely honest with you when he claimed that the secret behind the zero cases of hypertension among the Yanomami Indians is Coenzyme Q10, a ‘little known’ antioxidant which is present in abundance in their native foods. The fact is that Coenzyme Q10 is well-known in the medical science world. It is produced naturally by the human body, its supplements are in the market and its levels in the body only drop in case the body is battling serious diseases like cancer, genetic disorders, diabetes, heart conditions, HIV/AIDS, muscular dystrophies, and Parkinson’s disease. [Mayo Clinic]. And as for the INTERSALT study, the scammer did not tell you that the result of that research was largely rejected by the medical community because it failed to take into account the biological and cultural diversity of the 52 ethnic groups from around the world that participated in the study before arriving at the conclusion that low salt intake reduces high blood pressure. Even Stamler, the lead researcher, acknowledged this, and called for more research before a usable inference can be drawn. In other words, the results of that study were inconclusive … and it is to this day. So as you can see, Blood Pressure Protocol is based on half-truths and flat-out lies and so cannot work! All you are going to receive if you buy this eBook is diet recipes that is no better that the normal food you eat … and it will do little to nothing to reduce your blood pressure! Final Conclusion: DON’T BUY Dr Channing’s Blood Pressure Protocol. It is A Scam! Be sure to ignore all the pop ups preventing you from leaving the website as you try to close it. I have seen reports of patients who actually paid the $37 price for the eBook, and not receiving any download link! So I cannot guarantee that you’ll receive what you paid for, but I’m guaranteeing you that you’ll receive upsells (offers to buy other related products from the same seller) and a lot of spam emails urging you to try one product after another. If this review has helped you, or you know to whom it will be helpful, please share to that person so that he/she too will be informed and stay away from Blood Pressure Protocol. Those antihypertensive drugs Riley lambasted are still your viable option to reduce your high blood pressure, so don’t throw them away. Instead, use them under the supervision of your doctor. You are most welcome. I’m glad you found this review useful. Thanks for putting this information out here where people can try to investigate spending their hard earned money. My husband would have had a lot to say if I was once again @ wasting money” on programs that don’t work. I just hate all these meds I take and how they make me feel so awful. I understand your predicament. Taking drugs is not a pleasant thing, yet it is effective and far better than scams like this, which just takes away your hard-earned money in exchange for nothing. I’m happy that you found this review on time! I find that pretty well all those videos that drag on and on and take forever to get to the point are scams. Soon as the voice starts I close the browser. 99.9999999 % are a waste of your time. you are debunking an extensive research of 19 pages with 3 pages write up. And encourage people to continue using drugs which tends to cure 1 and give you 5 problems. God will judge all of you speedily. he that has ear let him hear. anyone who truly want to be free can be free from hbp if the can do simple research and change their lifestyle and diet. western life and diet brought all the diseas to human. I’m NOT on any ‘big pharma’ payroll. I’m just a medical student who happens to be a health blogger. It’s obvious you didn’t read this review properly, ‘cos if you did you would have realized what I said about the Intersalt research, and what I said concerning antihypertensive drugs and natural remedy. Maybe when you properly study my review, then we can have a fruitful discussion. This might be a scam but you are a scam too with your article. YOu are a brainwashed medical student..
Before you say it’s a scam you should find evidence of people who have tried it and it didn’t work. That’s what I would call a proper conclusive review. Do you really be live that ,for a medical student you have all in front of you! Should reads believe, not as typed,by thecway I have not bought anything! Dear you are right. God bless you. This video is scam. The man is under criminal charges. Given your age, I strongly advise that you see a doctor immediately so that he could conduct tests to rule out problems with your kidneys, blood vessels, your adrenal glands and your pituitary (if need be). Assuming that you haven’t done that already, you need to make some lifestyle changes. Restrict your salt intake, stop smoking and drinking alcohol (if you do) etc. But first of all, see your doctor before trying any home remedy or taking drugs for your high BP. If you are willing, I’d like to hear from you after you’ve seen a doctor. Either comment here or use the contact page to reach me. I wish you good health! I have done all that you suggested for over 15 years, & no changes have occurred! I ake prescribed Meds or drugs for my HBO! I’m glad I read this, I was sceptical when the sale ad for protocol was so long and repeated itself over and over. I started to buy it and then decided to google the product first and found your article. Thanks for saving me my hard earned money. I have Dr appointment Tuesday. I just love how gullible some people can be when they fall 100% for these scam ads that promise results that are easily debunked if one just takes the time to do a little research.As you stated there is no info on a cardiologist Dr. Channing and David Riley’s photo is as real as the dozens of other photos of him in several other online ads.The truth is that yes certain dietary changes can be helpful in lowering HBP and certain supplements are proven beneficial,but you certainly do not need to pay money to find out about them.Since Co-Enzyme Q10 seems to be the main miracle behind this “BP Protocol”,just go out and buy the supplement and avoid all the hassle! Is it possible to lower one’s blood pressure without medication or drugs of any kind? Elgar thanks very much for this information that you share here. I am 41 years i have BP for 2 years now am on medication. I really don’t like the idea of taking medicine every day . I will try this your method I hope it will work for me. I am tired of taking medicine every day to control my BP. I new this was probably junk but some of the information presented for lowering blood pressure I had read other places so I wanted to see the complete solution they offered. Much to my dismay the purchase process has multiple up sells. In spite of refusing the up sells rather than charging the $37 they indicated, they are now trying to charge me $111 These people are not only scammers but may be complete crooks. Surely, I will not go for such products, there are lots of free information the net that are available even on trusted websites……. I prefer to go with natural route to cure such health problems. a book on marketing these days. How is it that a person who received helpful information at NO CHARGE by calling this man on the phone would find it necessary to sell it to me for $37+? “Freely received-freely give” if it is legit. Why not just give us the info you say you paid nothing for yourself and let us do what you did? It is so sad that the desperate public cannot trust anything sent out via media (tv, mail, Internet, phone). There is so much scammers working both the pros and cons of a product. The pros end up trying to get rich by selling you something; the cons end up receiving some financial kickbacks from those who have something to lose if the product does in fact prove beneficial. And, of course, each side convincingly deny all accusations So sad that there is so much dishonesty in the world. Wish it were not so – what a wonderful world this would be!